...in which we find out what's happening these days at the sites of the boring postcards of two weeks past! 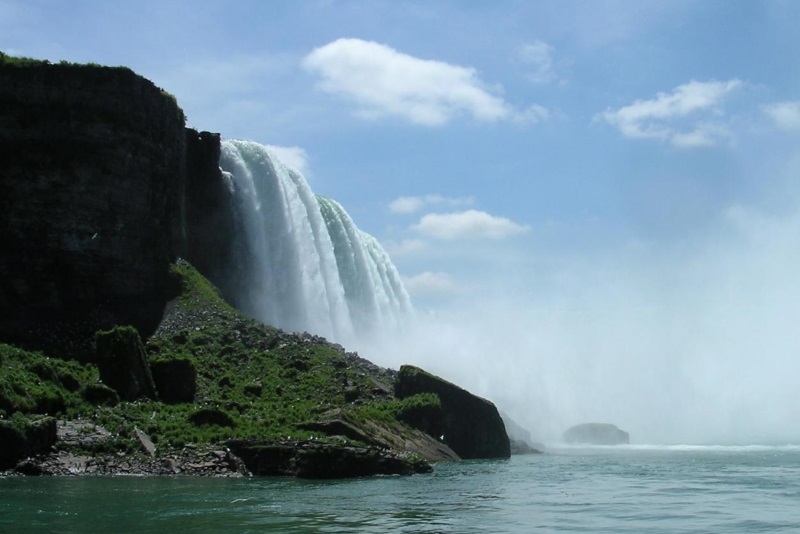 The Horseshoe Falls are still there. I mean, duh. It's not explained on the original postcard, but Nancy Hanks Lincoln was Abraham Lincoln's mom. She died in 1818 after the family cow got into a patch of the wrong plant, which poisoned its milk. It sounds kind of exotic, but this kind of thing happened all the time back in the day, back before our lives were made so much worse by the arrival of abundant processed foods. Anyway, Ms. Lincoln's gravesite eventually became the Indiana State Memorial, it went Federal in 1966 and is now part of the Lincoln Boyhood National Memorial. The memorial building shown on the postcard is still there. At a glance, it probably has more historical interest as a quintessential WPA structure than for anything to do with Honest Abe. 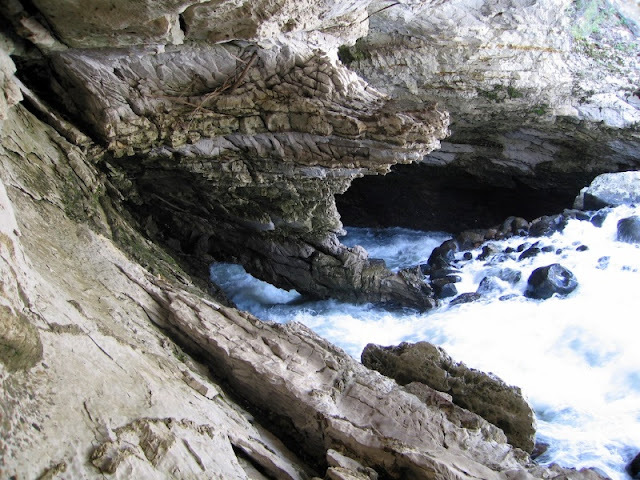 There's a place like this in Southern Oregon, too, where a river suddenly ducks underground for a while through an underground cavern.1 It's a pretty cool thing to see in person. The Sinks at Lander are2 still there. The Chinese Sunken Garden is... well, it's kind of complicated. It isn't, and wasn't, a Chinese Garden. It's a Japanese Garden. It was redesignated as a Chinese Garden in the early 1940s, what with the war fever. It sounds like pure grandstanding, but the intent was apparently just to keep the place from being vandalized. 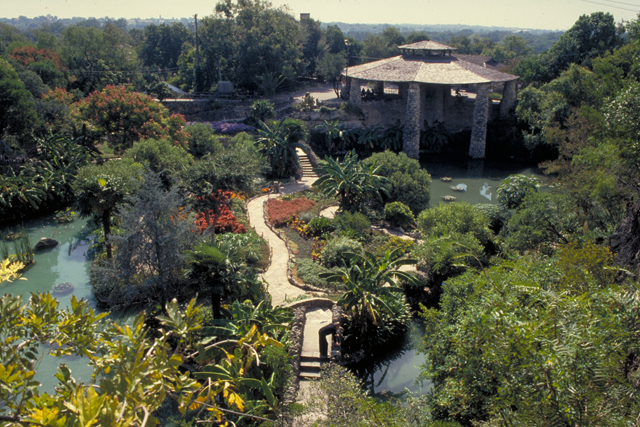 Once the Second World War was over, in 1984, the City of San Antonio formally re-renamed it the "San Antonio Japanese Tea Garden" at an event attended by dignitaries of the Japanese government, and then, over the ensuing years, slashed funding for its upkeep and pondered shutting it down. These days, though, it has been bailed out by private-sector donors. Thanks, San Antonio Parks Foundation! After an alarming amount of time spent in research, I think that the current landscaping plan obscures the angle that the postcard photo was taken from. But this gives you a pretty good idea of what the place is looking like these days. Let's go with it is still there. Far cooler than the postcard-future of the Shangri-La, however, is the postcard-past of the Shangri-La. Behold! This is found footage assembled by multimedia artist Mack MacFarland; I found it on the MLK in Motion blog. I think it's great. 1 I sweated over this phrasing. "Underground cavern" is redundant; however, "cavern" seems naked without the adjective. 2 The Lander Sinks is still there? After all, "the Sinks" is a singular thing. It's not like there are more than one "sink" there. I went with are after realizing that I hadn't hesitated over American Falls are still there, even though American Falls is a single entity. American Falls is still there. American Falls are still there. You make the call.